Glynn and Floy were selling farm implements and Fordson tractors, in the mid 1920`s from what had been the blacksmiths shop on the Sheridan Rd. (M-13) C.C. Banting convinced grampa to take a couple of Allis Chalmers on consignment. 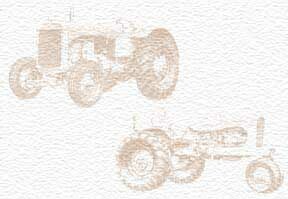 Problems arose when Henry Ford told Glynn that he could not sell competitors tractors. Glynn told Henry to take his Fordsons home ,as the Allis`s sold better. In 1935 he took on a dealership. I have the paperwork that lists assets, debt etc. Most of the tractors came in on railcars, as well as the all crop harvesters, that came 8 to a railcar. He would even drive to La Port to pickup 2 combines daily. Reportedly sold more All Crop harvesters than any other dealer for a many years. He also would cannibalize a machine for parts if a customer need parts, "made the main office mad" he said, and caused dealer issues. Also the combine people from La Port would bring up combines every year and run tests on them, using his fields of grain. Told of the men making a round, tearing the combine apart, put it back together, and do another round, then repeat. He also had the Minneapolis Moline and the Massy Harris dealership, in the same building. All of which he closed out in late 1946. In summer of 1965 the building was cleaned out, my brothers and I had to throw out everything, manuals, paperwork, parts, posters, signs, just everything, I asked about keeping some of the posters, etc. told no! Grampa and dad did tell me in the late 80`s that maybe they should have let me keep some things. Glynn died in 1989, Floy in 1995. my dad in 2012.